Now this is an idea I find really cute. I can easily see Tenzin rambling on about everything, unaware that Korra is fast asleep. Very cute, it's great to see you back! Yeah this is a nice idea I like it. How did you come up with that equation, are you a maths scholar Cerulean? I took BC Calc in high school so that I could get college credit for it and NEVER have to look at math again while in college! [At least not in this vicinity]. Your art should come with a warning of some sort. It's great to see your cute style back here again! It's lovely as always! Z_C, I came back only to disappear again! Alas. Maybe this time I will have more time for doodles. Grieves, I am not a maths scholar. I do happen to have someone in my back pocket who does know some impressive math and I implored him for an impressive looking equation. Tongone, Sorry! Maybe if you just concentrate on how I drew Korra's piggy nose you don't have to look at the math? This was a late night doodle that ran away from me. It combines two loves of mine: Avatar and Pride and Prejudice. Maybe someday I'll draw this up proper like it should be. For now, enjoy this doodle. Well, heck. Now I have to read Pride and Prejudice. Love the expression work in this, really simple and subtle. Although if I had to offer some constructive criticism, I think some slight variance in the lines you use could really look great? Grieves, Thank you. My line work is something that I struggle with and need to work on. Especially when working digitally, I feel lost sometimes in contour. Dear All, Just a super quick note from me today! I'm deep in my final year at university and drawing has fallen to only notebook doodles. 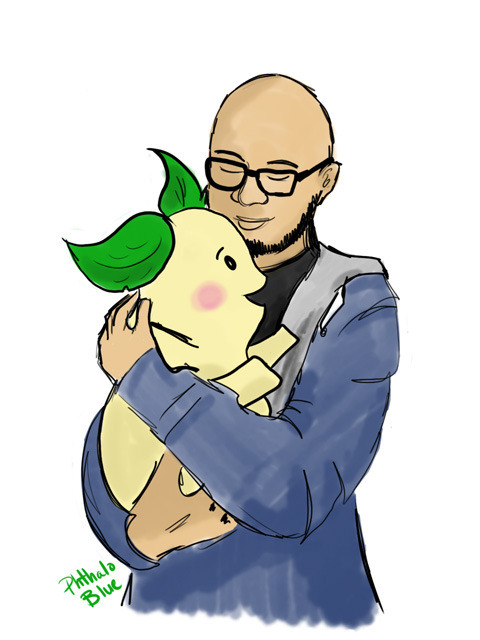 But I did have time to squeeze this quick manip/drawing of an old Pabu work. 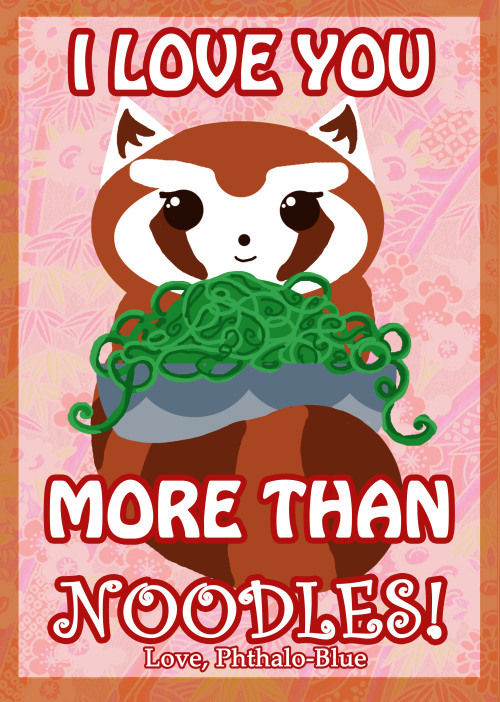 I love you more than noodles too. That's quite adorable! ^_^ Happy V-day to you! Re: Cerulean's Avatar Art More New Art! Yep everyone, I'm back with some new art. And a big theory on how I am speculating book 4 of Korra will go down. It all started over in the ASN Veterans thread where I drew what I thought was a funny image and turned out to be the end of all things. But the good news is that it made me dust off my drawing tablet and as such, I drew something for us all. It is my belief that book 4 will see the Balancing of the world. Spirits and humans are living together once again, so is there a need for a spirit-human intermediary anymore? I think not. Therefore, I’m proposing that at the end of Book 4 Korra and Raava will part ways forever. Let’s back up a bit. As the end of Book 3 made painfully clear, Korra struggles with her identity outside of the title of “avatar”. 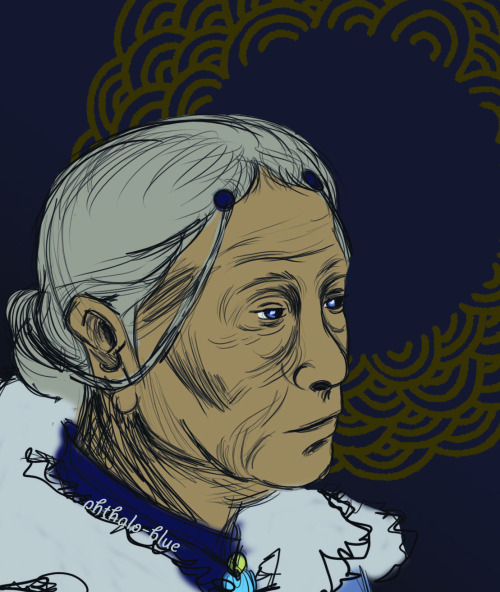 The following villains furthered that idea in her mind that “Korra” and “avatar” are as one and neither are necessary. To her, defeating the villains is about proving her worth in the world. At the end of Book 3 when Tenzin declares that the Nomads will take over peace keeping duties (a traditional avatar role), Korra silently breaks down once again and feels that because the avatar is no longer needed, Korra is no longer needed, but this time there is no “bad guy” to defeat because the one saying it is her own mentor. In addition to Korra’s identity crisis, we have a different drama unfolding: that of the merging of the spirits and humans once again. Book 2 unlocked those sealed gates and since then a trans-physical connection has begun. As consequence to this, when Korra did so, she lost her connection to the previous avatars. This cutting of ties accomplishes two things: it furthers Korra’s identity crisis of establishing herself outside of the avatar role, and, it begins the process of unraveling 10,000 years of the deep connection of human and spirit via Raava and the avatar. 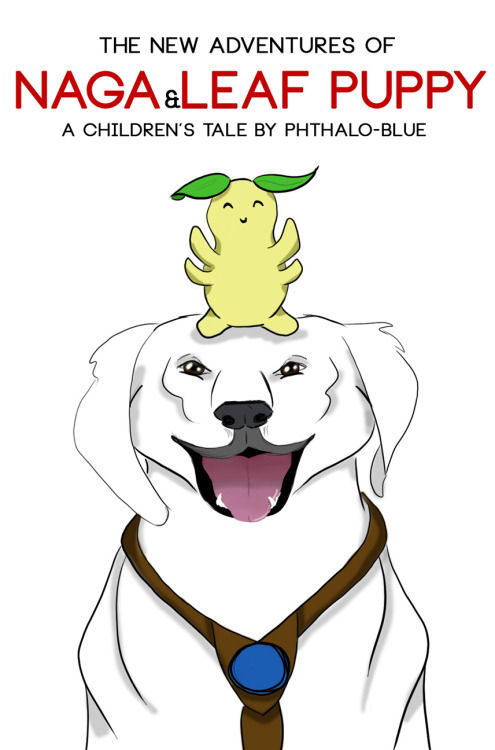 So how does this all unfold in Book 4? Truth be told, the world is returning to the state that it was in before Wan stepped in and changed everything. Vatu is defeated and no longer threat. This gives Raava the chance for her to be the change in the world herself. Since the boundaries of spirit world and human world are eradicated, Raava can manage the balance herself. The traditional role of the avatar then no longer becomes necessary. So where does that leave Korra? It leaves her learning to identify herself as an individual outside of any preconceived notions forced upon her. Korra is for the first time free to choose her own destiny (where have we heard that before?). 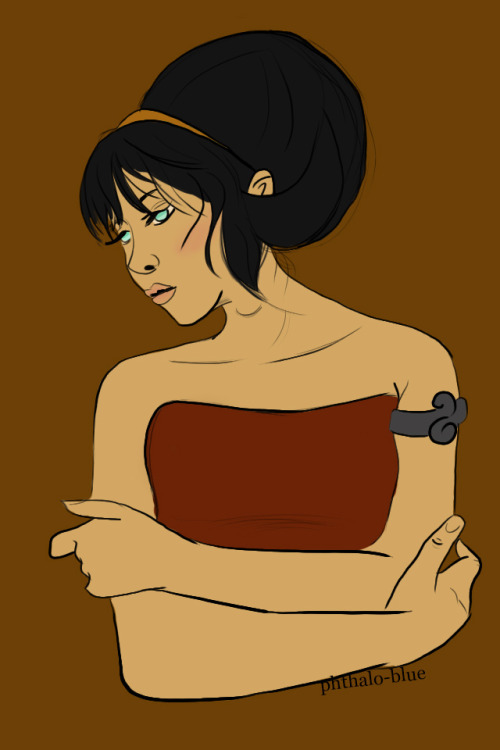 And instead of some outside force making Korra give it up, she realizes this on her own and with Raava, comes to a free willed decision; perhaps the first free willed decision of her life. (Harken back to the first words she spoke on camera, “I’m the avatar and you gotta deal with it!” transforming into a proposed final line of, “I’m no longer the avatar and I gotta deal with it.”) She lets Raava go and steps into her own true self. And then she and Mako prob go and make babies. Not the end. I kept my tablet out and ended up with a little late night doodle. 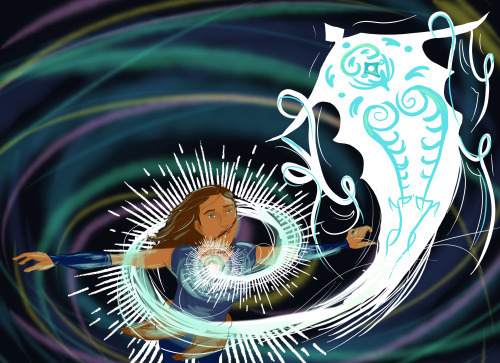 I really hope we get to see awesome Katara in the next season. Rose Unicorn, thank you so much! 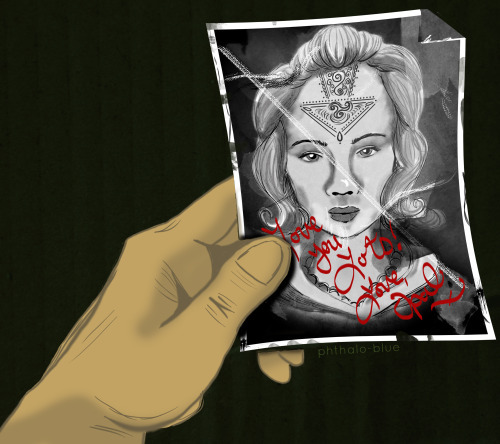 So, after that episode I got to thinking what if Bolin had kept a picture of Opal with him at all times? So, I have a small collection of work to share this evening, mostly centered around the small little Spirit whom I have dubbed "Leaf Puppy". Post edited to get rid of image tags. Please don't include the tags next time! 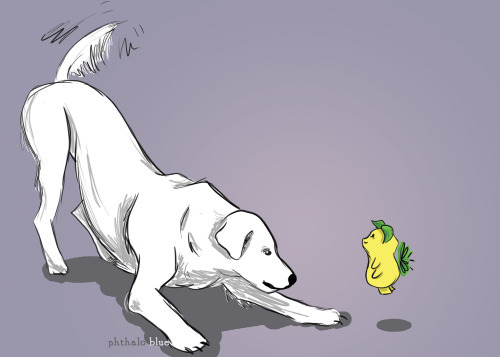 These doodles are freaking adorable. Much love to you Cerulean!